Greetings and Happy New Year! Long time, no see, right? I've really, really, REALLY missed blogging, but I took a much needed break and, like it or not...I'm back! If you contacted me and I didn't respond, I apologize because as most of my regular followers know, for the past 4-1/2 years, I have been steadfast in posting almost daily and responding to everyone promptly. As some of you know, this past year has been difficult for a multitude of reasons. It's been a year filled with loss, a lot of change, and a whole lot of work. No matter how much we have in front of us to do...we only have 24 hours in a single day to do it. I essentially burned myself out and was just plain exhausted, both physically and emotionally. Unfortunately, I am one of those people that rarely (if ever) says no, and I have the tendency to take on more than I should and still maintain some sense of sanity. As many of you know I lost my mother a year ago, and we also moved, which involved both selling a home and purchasing a new home and all of the projects that we had done in the new home once we got moved in. Not to mention, something that I detest immensely...MOVING! I feel like all I did every single day was work, pack, clean and try to keep my home looking like nobody lived there. There was only one little problem was....we did live there! As a food blogger, one of the things you understand is what havoc blogging does to your kitchen. Basically, by the time you get done cooking, photographing, writing up your recipe and your blog post...oh, and actually get the chance to eat what you prepared...it looks like a bomb went off in your kitchen; a really big bomb at that. And that scenario repeats itself almost EVERY...SINGLE...DAY! I also work full time and am gone for almost 10 hours a day, so all of this goes on in my "spare time". I have to squeeze a little sleep in there as well and more often than not, never got more than about 4 hours on any given night. Throw in the little fact I also take on various other food projects...some small and some large. Regardless of how much work all of this is, for me it is a labor of love and I really enjoy it. I couldn't or wouldn't have invested this much time in this for all these years in this if I didn't. But this past year, with the addition of both selling my home and buying a new one, and all that entailed just pushed me to my limits and something had to give. But, we are now pretty well settled in and are finally beginning to feel like we don't just work here, but actually live here. 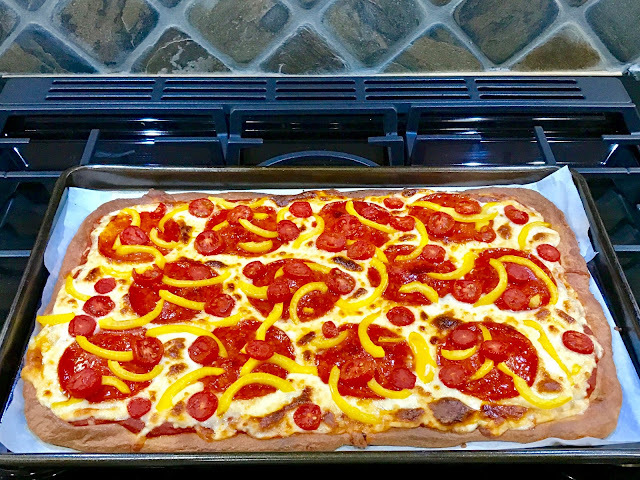 I decided to start my first post of 2017 off with what I made for dinner this evening and what also happens to be one of my absolute favorite recipes...Cheese Head Pizza! It's one of those recipes that you can serve to all of your friends and family that aren't grain or gluten free as well because you honestly can't tell that it is grain and gluten free. I've made it so frequently now that I can usually make it and bake it and have it on the table in about 30 minutes. 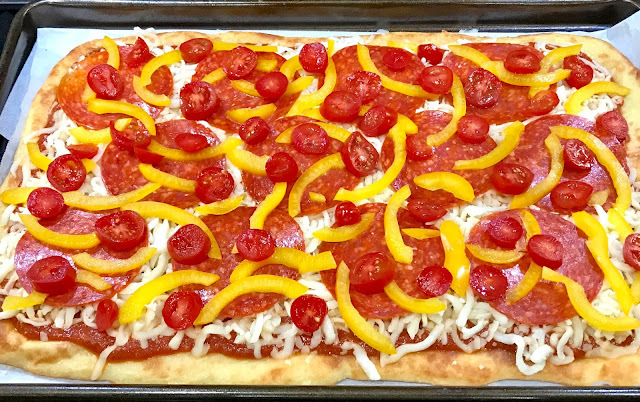 I topped tonight's pizza with large sandwich-sized slices of Boar's Head pepperoni, sliced yellow bell peppers and sliced fresh mini San Marzano tomatoes. I've been sick this past week with some kind of virus and am still not feeling too snappy, but tonight's pizza is about the only thing that has actually tasted good to me all week. I actually enjoyed it. I've included the recipe below and a few photos I snapped as well. Oh, and if you didn't already read between the lines...I really missed all of you and wish all of you a very happy and healthy new year! Enjoy! Preheat oven to 425 degrees F. Line a large baking sheet or pizza pan with parchment paper. Place mozzarella and cream cheese in a medium bowl. Heat cheese in microwave on high for 45 seconds; stir and heat an additional 30 to 45 seconds or until a hot melty mass of cheese is formed. While cheese is melting in microwave, stir almond flour, Parmesan, salt, garlic powder and Italian seasoning together in a small bowl. Add flour mixture and egg to bowl of hot melted cheese. Working quickly, fold and stir mixture together with a rubber spatula until a ball of dough is formed (make sure cheese mixture is hot before adding flour and egg). Place ball of dough in center of parchment lined baking sheet (or on a non-stick baking sheet or pizza pan). Oil hands with olive oil (*see note/updated instructions below) and press dough out into desired shape (round, oval or rectangular) until about ¼-inch thick or pour the tablespoon of olive oil on top of the dough after placing it in the center of baking sheet and use a rubber spatula to press and spread the dough out evenly. Prick holes all over crust surface with a fork to prevent crust from bubbling up. Bake for 10 to 15 minutes or until golden brown (rotate pan half way through for even browning). 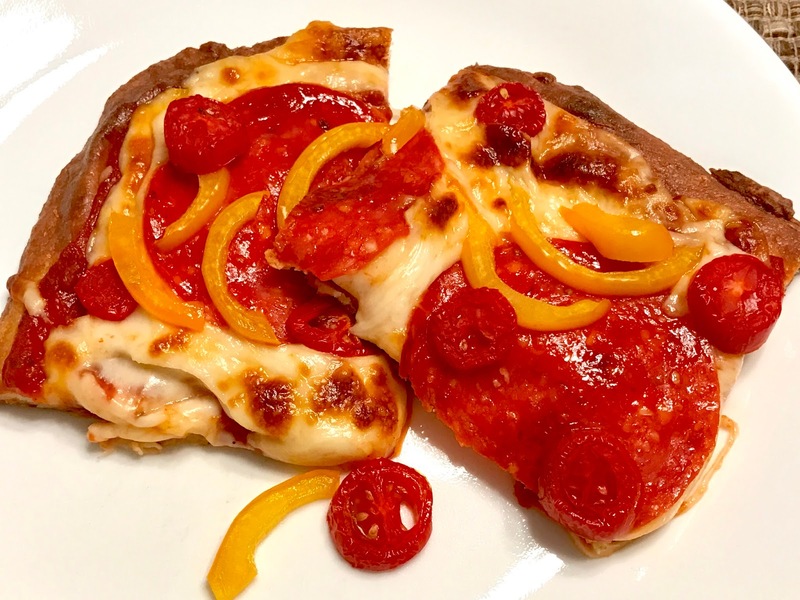 Remove crust and top with pizza sauce, additional cheese, and any desired toppings. Bake an additional 5 to 7 minutes or until heated through. Run briefly under the broiler, if browning is desired. *Note/Update: Rather than oiling hands with olive oil to press dough out, a much easier (and less messy) way to press it out is to pour the tablespoon of olive oil on top of the dough after placing it in the center of baking sheet and use a rubber spatula to press and spread the dough out evenly. If necessary, lightly oil the rubber spatula to keep from sticking. I am glad that you are back to posting as I have missed you! Happy New Year to you as well! I'm sure I speak for thousands when I say how pleased we are to hear that you are settled and feeling refreshed after a much-needed break. And just because you have been quiet doesn't mean we aren't using all sorts of your wonderful meal ideas and recipes. I don't think I could ever thank you enough for everything you have contributed to keeping us grain-free low-carb people healthy! And as an extra note, I have to tell you, three tries has made absolutely perfect - my great-grandmother's fruitcake was absolutely magnificent this year! So much so that hubby has declared it to be even better than the original! Once again, so many thanks for your help in getting that recipe changed up. We moved a year and a half ago, and it has been a huge upheaval that really does take a lot of time to cope with, and a lot of time to feel you are settled in that new space, so I completely understand you were feeling somewhat overwhelmed. Welcome back!! Hi GG, it's good to hear from you again! Happy New Year to you. I totally understand with all you've been through this past year that you took some time off.I hope you are now feeling refreshed. We had your Fat Head Cheese Pizza just last week. It's definitely a keeper. I'm looking forward to future recipes for the Instant Pot since "Santa" (aka Me) brought me one for Christmas. I am so very happy to hear that your great-grandmother's fruitcake recipe turned out so perfectly this year. It's quite a feat to accomplish actually since there is such a difference when baking without regular flour. The fact your husband declared it better than the original literally "takes the cake"! How nice is that??? Hi and Happy 2017 Gourmet Girl! I was so happy to see your new posts. I'm sure I speak for all of your followers when I say I completely understand your need to take a breather! Please don't ever feel you need to post every day, or as frequently as you have done in the past, because we now have access to many wonderful recipes--thanks to you. We are happy to "see" you whenever you have the time! It's so *good* to hear from you. When we "bite-off-more-than-we-can-chew" it can get pretty rough, especially when unforeseen circumstances get thrown in the mix on top of everything. (Been there, done that.) Glad things have settled down for you. What do you think? Perhaps you could learn to *love* a little slower pace this year ... it works for me! :-) Wishing you much peace and happiness in the coming year. Relax and enjoy your lovely new home and all the fruits of your considerable labors. Best wishes to you and yours. I missed your posts during your much-needed break but am glad you are back. Question - Where do you find 3 ounce bars of brick style cream cheese that you use in this Cheese Head Pizza recipe? Thanks so much for the kind words and you are right...sometimes we do bite off more than we can chew. I know I'm guilty of that for sure. I'm so happy you had plenty of "old" recipes to get by with during my absence. Oh, and regarding that fruitcake recipe...I never posted it. It's one that BarbP emailed me about a couple of years or more ago and she had sent me her original old family heirloom recipe and asked for my help in making it grain free. It's one of those that has to sit for many weeks wrapped up so she had to wait a while to see how it turned out. She wrote again after trying it and we tweaked it a bit more until she got it just right. Maybe she will be gracious enough to share it now in its final form since she now has it so her husband likes it better than the original recipe! How great is that? So BarbP, if you would like for me to share it with Kathy/CyberSis, (I can also do it privately via email if you prefer), just pass it along and let me know. I would be happy to share my fruitcake recipe, but Kathy might not want it when she understands what it is, so I will explain: this original recipe is my English great grandmother's traditional dark Christmas cake, and I have eaten it every year of my life, as have my children. I decided to try to modify it a few years ago when our daughter was diagnosed as celiac and this was the one thing that she was devastated she'd never have again! While the modifications are fantastic, it is absolutely not WB compliant. It is grain and added-sugar free, but it has a significant amount of candied fruit in it as well as dates and raisins. And it gets soaked in brandy 3 or 4 times over a period of a few months. Still, as a very occasional holiday treat for me, it is wonderful. So Kathy, if you are interested, I'll type up the recipe and pass it on, but it isn't really just something you whip up and try - it's definitely a commitment! And of course you have to like that sort of flavour profile. What I'd like to work on someday is a more "accessible" recipe (if you know what I mean) that would be more nutty than fruity but at the same time be a credible reminder of the "real thing." This past Christmas season, I had intended to tweak GGC's pound cake recipe a bit, but procrastination got the best of me. Ayla's recipe is very "tweak-able," in fact. She helped me turn it into the most wonderful lemon cake for my mom's birthday. Later, on my own, I made a sort of gingerbread out of it, which turned out to be quite tasty. So I think of this recipe (which is wonderful just as it is, by the way) as kind of a "blank canvas" upon which to superimpose all kinds of nifty variations. Thanks so much, Barb, for your willingness to share. I'm not surprised that your recipe turned out so well with Ayla at the helm. Best to you and to your daughter. Welcome back! We've missed you. GG....I just found this site and I'm soooo excited to try this pizza😊. It sounds and looks scrumptious. I'm new to all this low carb stuff and it really began with a wake up call for my teenage daughter having issues with gluten. What an eye opener. So here I am having to learn a new way to cook without having to live on salads for the rest of our lives🙄. I'm Cajun and my mind couldn't go there😳. So thank you from the bottom of my heart❤️. I'm sorry to hear about the loss of your mom and all the craziness you've been through recently. Tomorrow is Super Bowl and my family always get together at our son's house for the game. While none of us are huge football fans, we love the commercials and the half time shows. Tomorrow's menu is personal pan pizzas. My son is going to get a slew of pizza crusts and different toppings so everyone can make their own. Since I am the only one who stays away from wheat, I want to bring my own crust made with your cheesehead recipe. It will be crazy at his house tomorrow what with everyone there, kids, grandkids, friends, and dogs and cats, so I was hoping I could make the crust today. Do I need to freeze it or just refrigerate it? Will it stay crisp? Or should I just take something else that's WB compliant. I really missed your posts and was hoping everything was ok. Glad you were taking a well deserved break. Your posts and recipes have been like a beacon that helped to keep me on the WB path and I want to thank you for that. Take care and learn how to say NO. When my kids were in school I was pulled every which way each and everyday simply because I couldn't say no. (I always joked that I had "Ask me I'll do it" tattooed on my forehead). I felt much better when I was finally able to turn down requests. Even though I have a tendency to lurk on websites, I just had to send you some love. My husband (an enthusiastic carnivore) & I (a former vegetarian) need to get out of some bad dietary habits & overcome aging metabolisms, so we agreed to go low carb as of a couple of weeks ago. I was honestly getting depressed thinking about menus full of nothing but meat, so went looking for some variety. Decided I didn't want every meal to have protein powder and xanthan gum. And then your site popped up. Your post about making "zoodles" that weren't watery brought me in. Your Spanikopita pie brought me back. Your Cheese Head pizza crust completely won me over. I'll try any recipe you post. You get textures I didn't know were possible in low carb dishes, and you're not afraid to innovate or play with ingredients & flavors. Plus, your recipes are easy to understand, and you post some lovely pics of food. Win, win, win, and win. Being new to the site, I won't pretend an intimacy we don't have, but just know that there are new people every day who are so happy you're able to keep doing and sharing what you do!